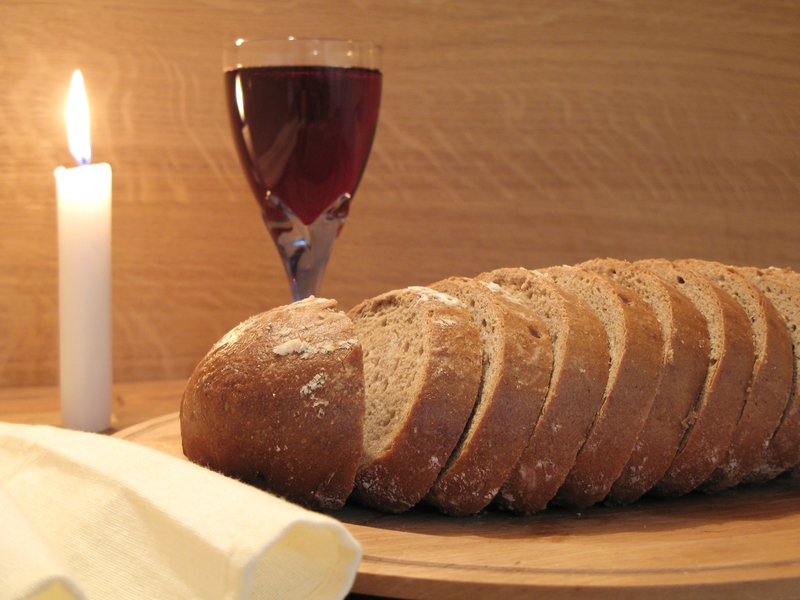 Have you ever given much thought to the Lord’s Supper? Have you ever wondered why we do the Communion Service at Truth Fellowship Live the way we do it? What is the Communion Service all about? The Lord’s Supper, i.e. Communion, is an important celebration of worship where believers come together to remember the sacrifice made by Jesus Christ made on their behalf and to look forward to His return. One of the primary passages of Scripture involving this act of worship is found in 1 Cor 11:27-32. Corinth was a rich costal city. It had a very diverse culture that was known for its “fast” living. The city had many temples to many gods and the practice of idolatry was abundant. Temple prostitution was a mainstay of the population. So, the people of the city were as far from Christ as possible. The band of Christians living in Corinth had many temptations to overcome. Paul said that God would give them strength to overcome all of these (1 Cor 10:13). But even so, these early Christians were divided to the point of contentiousness. In 1 Cor 11, Paul discusses various sorts of abuse in worship. He begins his rebuke with appropriate attire and preparation for worship (11:1-16) and then moves into abuses of the Lord’s Table during worship (11:17-22). Paul starts and ends this section by emphatically stating that he is not praising the Corinthians. They were not coming together in worship for the betterment of the Lord, but rather they were actually harming church life. The divisions were caused by fractions in the congregation who were seeking personal approval rather than true worship. Thus, when they came together for Communion, each was putting himself above the others. This behavior could not be praised; this is not the purpose of the church. Paul then instructs the Corinthians regarding the Lord’s Table (11:23-26). Paul explains that the Lord’s Supper came from God and was subsequently delivered to them (through Paul). The church is to look carefully at the example of Christ. He took bread, broke it, and gave it to them and He took the cup, identified it, and gave it to them. Both are to be taken for the same purpose, i.e. to do in remembrance of Christ. Therefore, the Lord’s Table was to proclaim the Lord’s death (11:26). This passage seems to demand respect and a solemn order. It is all about Jesus, not the people. Communion is celebrated to remember Him for what He died for as we look for Him to return. What were the Corinthians doing wrong? Paul then describes the error of the Communion practice in 1 Cor 11:27-32. The word “Therefore” in v. 27 connects this paragraph with the chastisement of the previous sections of Chapter 11. Paul is addressing the Corinthians regarding their disunity, particularly regarding how they worship. He calls on each person to carefully examine himself before he participates in the Communion celebration. They should come to the table to worship the body of the Lord. This is not a time to eat or drink, but rather a time of worship before the Christ. Paul warns there are consequences for those who do not approach the Lord’s Table in solemn observance of the work of Christ. The passage 1 Cor 11:27-32 can be summarized for the biblical audience as follows: Paul is rebuking the Corinthian church for inappropriately worshiping God, specifically during the Communion service. He emphatically states that those who practice Communion in an unworthy manner are disparaging the sacrifice Jesus made on our behalf. The responsibility of everyone who participates in Communion is to examine himself, so that he can appropriately worship Christ. Paul also warns that there are dire consequences for those who practice Communion in an unworthy manner and this comes from the Lord so that the church will not be condemned along with the rest of the world (i.e. the church should stand apart from the rest of the world). How does this passage relate to us? This passage relates directly to the Church of today. Communion is an important sacrament in the evangelical Christian church. People of today can come to the Communion table in an unworthy manner and detract from the worship environment of the Lord’s Table. Disunity between members of the congregation can also detract from the celebration. The differences between the first century church and the church of today are the way in which we practice Communion. In the New Testament church, it seems the Communion meal was more substantial and that people served themselves. That allowed people to push their way through the crowd. Also, there was enough wine available that people could actually get drunk at the table. Our serving today seems much more controlled. We give out limited portions so that gluttony and drunkenness cannot occur at our table. So, for us to come to the table in an unworthy manner has more to do with the attitude of the heart. Our divisions between others in our congregation can cause us to come to the table with a bitter heart or with great sorrow. Disunity between members of a congregation causes unworthy worship. Disunity is an issue in the church today. Often people come to worship with strong feelings against some of those in their congregation. These feelings distract from the quality of worship. For this reason, we need deal with problem relationships immediately, especially before they grow out of control. We should covenant together to repair damaged relationships before they begin to destroy our worship. There are consequences for those who practice Communion in an unworthy manner. We must understand that worship is very important. So often we neglect the idea that our practices have consequences. God will judge us for our improper worship settings. We need to remember that the membership of the church should be different from the rest of the world. Therefore, we should strive to maintain a proper relationship with God everyday through our devotional and prayer time so that we are able to properly worship God. Pure and pleasing worship occurs only when unity exists in the body. We should strive to build unity within the church. That occurs by helping the membership grow strong in Christ through discipleship. By each person moving closer to God, as in a triangle, people move closer to one-another. Preparation is important before coming for worship to the Lord’s Table. Each person should practice self-examination and not examination of others so that, through personal responsibility, a unified manner of worship can be achieved. How do we do Communion at Truth Fellowship Live? Ever since I first met Pastor Kern, I was impressed by the worship that was built into the Communion services he led. His services were always unique in the content, but the same worshipful environment was always created. At TFL we continue that pattern. Our Communion services take up the full worship time because they are seen as an important element of the church. Communion is not an add-on to a regular service. It is a service that emphasizes the four principles cited above. Our Communion service is a time for reflection. It is a time to get right with God and with others. It is a time to worship the one true God. It is a time to consider the imminent return of Jesus, the Messiah. Yes, our Communion service is unique and probably different from anything you have ever experienced. We greatly emphasize this time; we try to make it a time of worship. For those who attend the church for the service, you will have time to reflect and pray with the congregation. We will sing songs of worship together. For those who join us online, you will be given a time to pray and reflect between each of the teaching segments presented by Pastor Kern. Sunday, March 17 starting at 6:00 p.m. The entire service will be broadcast. The only difference for those joining us online will be that when the congregation is singing, a banner will be broadcast encouraging you to use the time for prayer and reflection. If at all possible, please consider joining us live for this time of wonderful celebration. This will truly be a time to remember our Lord Jesus Christ. Are you prepared to join us in Communion celebration as we remember Him for what He died for and as we look forward to His return? 2 Replies to "The Importance of Communion"